Happy Halloween! I think I'm as excited for the candy as my kids are! What is your favorite treat? I love Snickers and peanut m&m's. Ok, enough talk about chocolate...time to choose our winners from the OCS challenge. Thank you for the gorgeous creations! As always we used random.org to choose 2 winners to take home a Kraftin Kimmie stamp. Congrats ladies! Please email Lora (lora@onecrazystamper.com) to claim your stamp. Please check back tomorrow for our new challenge and thanks to all who played along!! Okay today's post title is a little bit of a play on words - it should probably be a Cheerful Bird!! This card front features Impression Obsession's Bird collage image, stamped on clear acetate with Versamark, then embossed with gold embossing enamel. The edges were also embossed with gold embossing enamel with the addition of glided fragments and chiffon color fragments. Using the Crop-a-dile each corner received a red eyelet and gold 20 gauge wire was threaded through the eyelets. 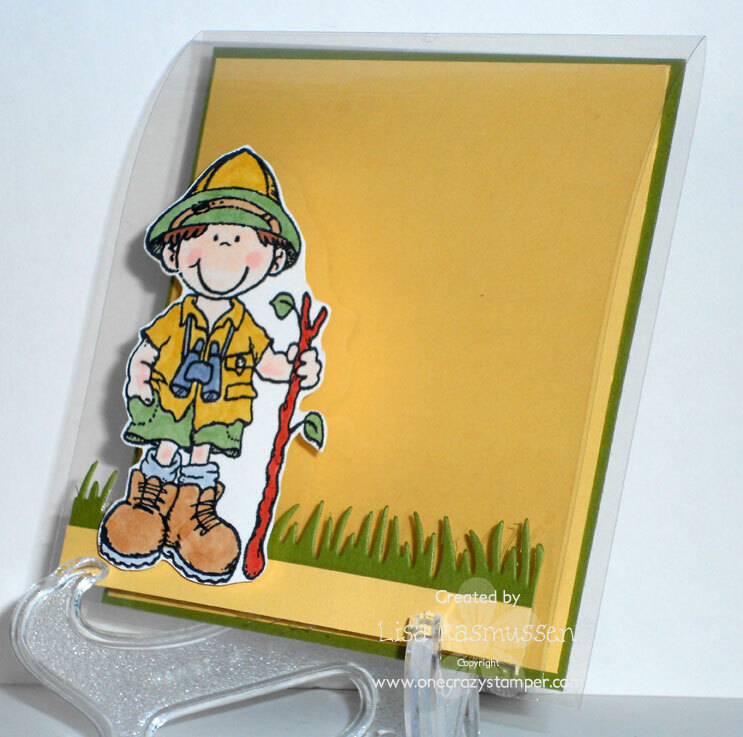 A prima rose was colored with R39 and attached to the card front with a glue dot. Today is the last day to enter the challenge here at One Crazy Stamper - the theme this month is clear/acetate, and you can win an awesome prize, so hurry and enter to win. It's that time of year.....when you just want to curl up in the evenings in your jammies with a good book! 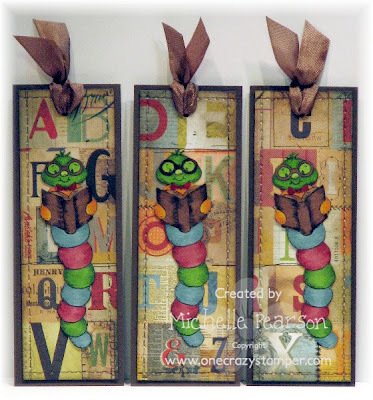 Lora from One Crazy Stampers sent along the Book Worm image from High Hopes Rubber Stamps....so what to do but make a few book markers! I have a 10 year old bookworm in the house....who usually has pile of books he's in the process of reading. I colored the images with Copic Markers: R59, R56, YG67, YG17, YG23, BG75, BG72, YR27, YR23, E49, E47, E44, E43. Papers are from Basic Grey's Clippings collection. I distressed the papers with Tim Holtz Walnut Stain Distress Ink. 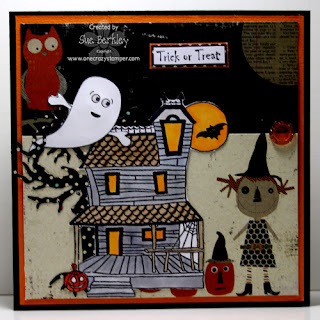 For this Halloween card, I used this stamp from Kraftin' Kimmie called Haunted House as the main focal point. I added Spooktacular from Your Next Stamp and the sentiment was from Got Candy, Trick or Treat set also from Your Next Stamp. I coloured Spooktacular with C00-No. 00 and then used the colourless blender to lighten it a bit. Both Spooktacular and the Haunted House were fuzzy cut. The Spooky Tree die was put slightly behind the Haunted House. There are still a couple more days to enter this month's acetate / clear elements challenge. 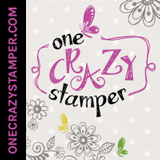 All of the above products are available at One Crazy Stamper. See you Thursday, for a brand new challenge. This image reminds me of one of my best friends! Whenever we go out I can expect her to say "SMILE!" and the pictures on facebook in a matter of minutes! It makes me laugh because it is so her! I think this will probably be us in another 20-30 years with her still yelling "smile!" I used Art Impressions Picture Perfect. I tried to make it look like a Polaroid with the black matting. I colored with copics and kept it simple with just the image. Hope you enjoyed! You have a few more days to get in on this months clear/acetate challenge. Designer Paper is Crate Paper Snow Day. For an autumn project I've chosen a stamp from Your Next Stamp (YNS) called "Ellie Loves Sunflowers". Materials used: Xpress It Blend Cardstock, Ranger Archival Ink, Copic Markers, Flower Soft, 3D Frame from Flower Soft, Acetate for window, Pop Dots, Large Flatback Pearls (Colored with Copic Markers); Cardstock from stash. All of the above items are available from One Crazy Stamper and for some unforeseen reason, I cannot get my links to work for any of the products. My apologies. 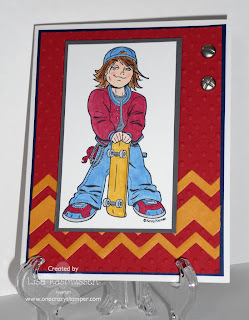 Tuesday is here again, which means it's my turn to show off my project for One Crazy Stamper, and guess what - I don't have a card to show you this week!!!!! This week I've created an adorable tealite holder with a Halloween theme. 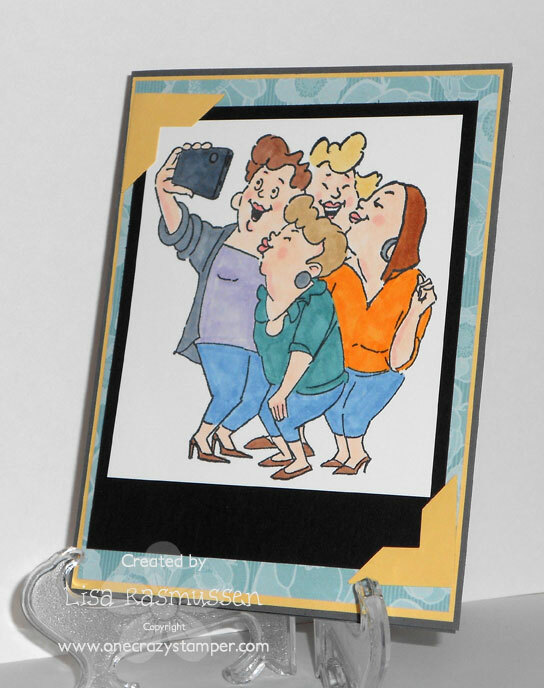 I stamped the image "Boo Family in Frame" from High Hopes four times on vellum paper, colored the images with Copics, and then made a square tealite holder from a piece of black cardstock. The lid as well as the inside base were made with the cardstock and the use of a Scor-Buddy tool. The tealite is battery powered so that there is no fire hazard! I think that a few more of these lined up on the front step for Halloween night would make a wonderful welcome for the trick or treaters!!! 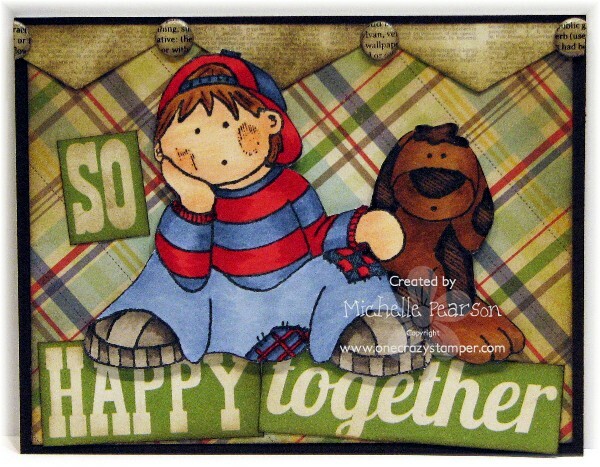 A boy and his dog...that's what I'm sharing today for One Crazy Stamper. Zack and Ozzie are from High Hopes Rubber Stamps. 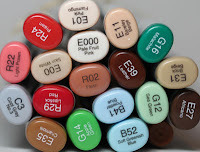 I colored the image with Copic Markers: W7, W5, W3, R29, R27, B99, B97, B95, B93, E37, E35, E11, E02, E00, E49, E47, E44, E43, E42. I paired the image with papers from Simple Stories' Summer Fresh collection. I distressed the papers and candi dot embellishments with Tim Holtz Walnut Stain Distress Ink. It has been a rather wet weekend so far. 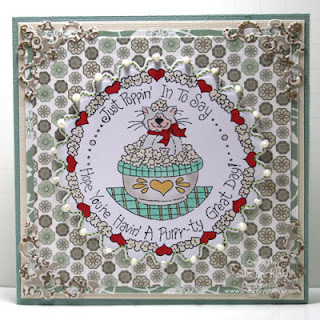 For my post today, I have used Popcorn Kitty from High Hopes Rubber Stamps. It doesn't show up too well in the photo, but I stitched around the edge of the circle with Sulky Thread No. 1177 Avocado Green. There is plenty of time to get creative and enter to win a fabulous prize for this months' acetate or clear elements challenge. Do visit Lora's store One Crazy Stamper for some amazing products, great prices and awesome classes. I was in the fall mood the other day! It finally cooled off and now it is back to super hot! So to hopefully get the message out there that I would like to wear my sweaters I had to use this super cute Your Next Stamp, Life is Great image. I made an easel card and used the blossom nestabilities and circle nesties! Super easy to cute images out that way! I had some leaf paper in my stash and it was great with the colors of the image! 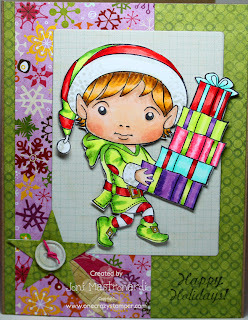 One Crazy Stamper now has a fabulous selection of My Favorite Things stamps and dies. Today I am featuring this Pure Innocence Loads of Love. I stamped her with Memento Tuxedo Black ink unto Xpress It Blending card. I paper pieced her dress and apron and the socks with My Mind's Eye Playdate. I used copics for her skin: E50, E11 and E25, E29 and E53 for her hair. Self Adhesive Pearls "Lime Green"
Hi all, for another WET Wonderful Wednesday. I think the skies have opened up and dumped our allotted maximum rainfall for the last 4 months all in one day. Better wet than white though~!! I apologize for this not posting on the OCS DT website - we were so busy today winterizing our 5th wheel at the lake, traveling home and unloading all our stuff - that I didn't notice it hadn't posted!! A cyberspace gremlin, no doubt!! I’ve chosen a Whimsy Stamp called “Silver Fairy” but decided to pretty her up with pink. To start with, the image was stamped onto Xpress It Blend cardstock, colored, fussy cut out and mounted onto a transparency. I cut a frame from the cardbase using Cherry Cobbler and mounted the transparency onto the inside of the frame. The inside of the base was matted in Yellow and a Pink DSP. Flowers and leaves were added to the outside frame and to her hair to add some dimension. The “For You” was adhered to the inside mat. We left home Friday, very rushed, only packing a few things to complete this card. You will have to excuse the poor photography, as I only have my camera and the lighting is not the best. Terrific Tuesday time at One Crazy Stamper and I have another fabulous fall themed card with Lulu to show you today. 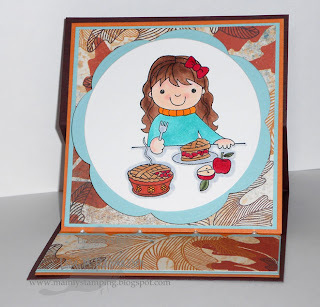 This pretty little Lulu is from the Kraftin Kimmie stamp set "Sugar and Spice", as is the sentiment. I have stamped the image on watercolor paper with Staz-on Jet Black ink, then colored it with Distress ink reinkers and a Pentel waterbrush. The frame is the Memory Box die "Orchard Tree" which I cut from a 6" x 6" sheet of Scor Tape, and then glittered with Java Bean Glitter Ritz. The leaves of the tree were highlighted with a Flower Soft mixed color. Are you looking for a great way to spend this coming weekend - if you are you should check out Kraftin' Kimmie's 3rd Annual Krafty Day Saturday, October 20 in London, Ontario. There will be lots of Krafty fun - kroppin' and kraftin' space, exculsive tote bags and a stamp, four make n' takes, snacks, lunch, draws, door prizes, and lots more. For more information please click here. 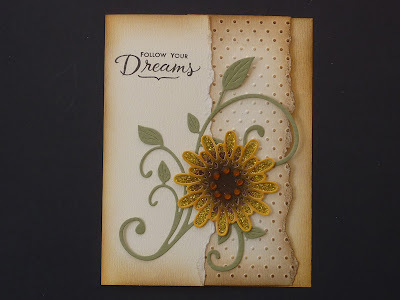 I have a sweet card for One Crazy Stamper featuring the Sun-Kissed Whimsy Stamp and the Impression-Obsession Herringbone Cover A Card background stamps. I inked up the background stamp with Tim Holtz Distress Inks in Wild Honey, Shabby Shutters and Tumbled Glass. Next I stamped my image on the background piece and colored the grass and hair wisps. I stamped the image again on white cardstock and colored it with Copic Markers: E59, E57, E44, R02, E11, E02, B95, B93, B91, YR68, Y38, YG63. I fussy cut out the girl and applied her over my background image...the touch of dimension is adorable. I cut out an element from the My Mind's Eye The Sweetest Thing Tangerine collection and added an element from the MME Sweetest Thing Decorative Brad Collection. A touch of distressing and you've got a cute card! Be sure to stop by the One Crazy Stamper store to see what fabulous deals Lora has for you this week! For my card today for One Crazy Stamper, I have used this cute stamp from the Lawrence Collection (Stampavie) called A Christmas Delivery. I'm fortunate enough to live fairly close to Lora's brick and mortar OCS store and am able to attend some of these classes. It is a great way to network and get new ideas. These are samples from the Christmas Wonderland class given yesterday by Christine. Well I have two cards to share with you today! I was unable to post with all of the other talented ladies on the design team due to the loss of a close friend of my husbands but I still wanted to participate in this months challenge! This months challenge was to use clear or acetate. I used acetate as the card base! 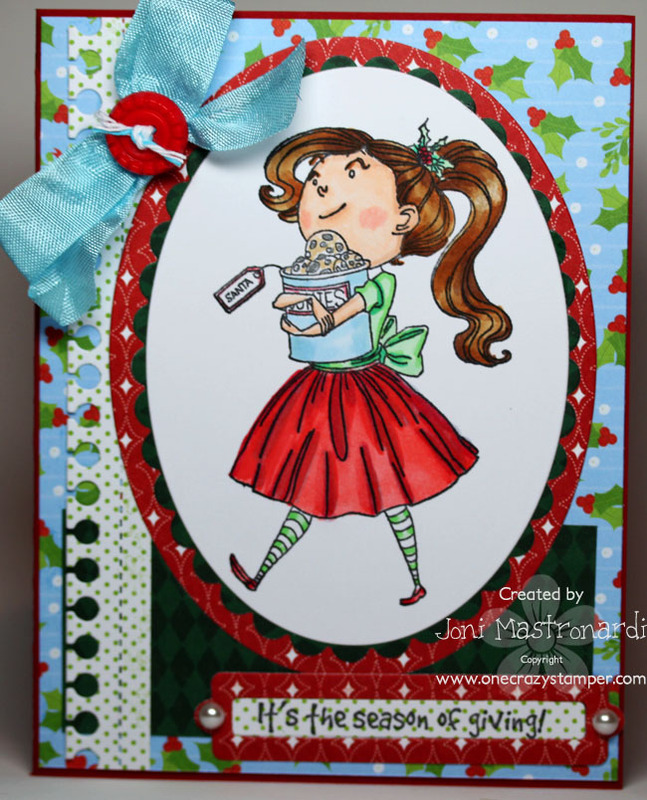 Such a fun way to make the basic square card! I used the adorable Walkabout Wallie. I also used MFT Dienamics for the grass. My next card uses Ryder Cole. I love these images because they are great for the in between masculine group. I used MFT Dienamics for the chevron pattern. I also used the fun brads in the store that look like screws. 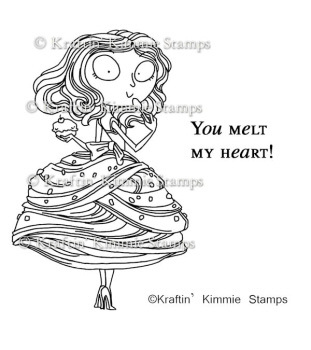 Today I have a new Kraftin Kimmie stamp: Penelope available at One Crazy Stamper.I stamped Penelope with Memento Tuxedo black ink unto Xpress It Blending Card. I used an oval nestie to cut out my focal image. I colored Penelope with the copics below. Fall is definitely in the air in our neck of the woods. There is that crispness about the temperature. For my project for OCS, I've chosen to use the YNS stamp "Ellie loves walking her dog" and the fence / grass from High Hopes' Garden Gate Background. Both images were stamped onto XPress-It Blend Cardstock with Tuxedo Black Momento Ink and then colored with Copic Markers. I chose DP from Basic Grey's Pyrus Collection, with the rich warm colors of Autumn. This month's challenge at OCS is under way with a "Clear or Transparent" challenge for all of you. Go to the OCS DT blog and scroll down to add your creation. Hope to see you there!! There is a crispness in the air, leaves are turning color and falling to the ground, and it's time for Terrific Tuesday at One Crazy Stamper. The challenge this month is to make a project with clear/acetate elements. This is High Hopes "Hay Ride", which I colored with Copics, fussy cut and then mounted on a raised shaker box. The shaker box is filled with glitter and beads to represent the changing autumn colors. 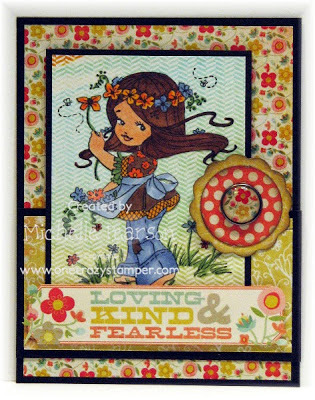 Both the frame and the background dp is from Simple Stories Harvest Lane collection pack. The sentiment is from Whimsy Stamps Autumn Letter Seals, which I also purchased at One Crazy Stamper. The month is young and you still have plenty of time to get creative and enter to win a fabulous prize here on the challenge blog, and don't forget that One Crazy Stamper is currently running a Design Team Call. For full details please read about both the challenge and the DT call by clicking on the headers at the top of the blog. 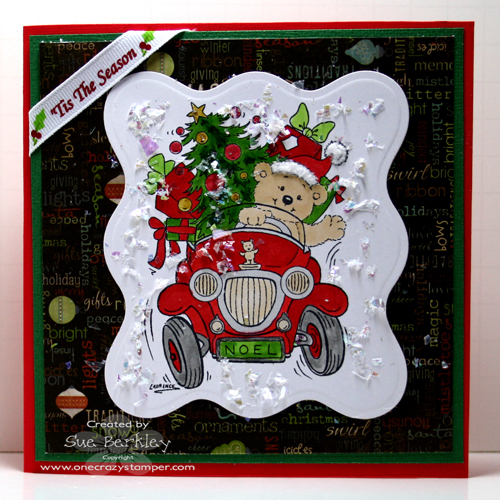 This month we have a fabulous guest designer Sue Allen. She's created a couple of super cute cards for us today. The first is using a Whimsy Stamp. I love the clean white look of this card. And second up is this sweet card using this sweet sentiment from Stampaive. Thanks so much for the inspiration Sue and thanks for joining us this month at OCS!!! 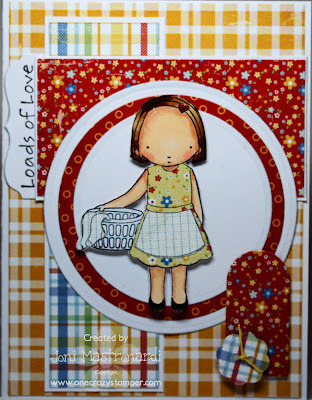 I’ve been seeing some really cute cards with negative die cuts on them so I tried it with these new Whimsy Stamp dies. But I liked the look of it with the die cuts not removed, so I kept them intact. I added one of my favorite Winter time sentiments and some twine. I love pink and I love pink even more used non traditionally, like for Christmas. I’d love to know what’s your favorite color? My little guy just had his 6th Birthday and I made him this card. He has some stuffed lions and tigers that he plays with all the time so this image from Whimsy is just perfect for the occasion. You may have noticed I use buttons a lot on my cards? Well OCS has some new button packs in the store and they are so cute and a great value. Only $2.48 for a big pack of buttons. Thanks for stopping by today and taking a look! I really love the Al a mode stamps from My Favorite Things and there a bunch of new ones in the OCS store. 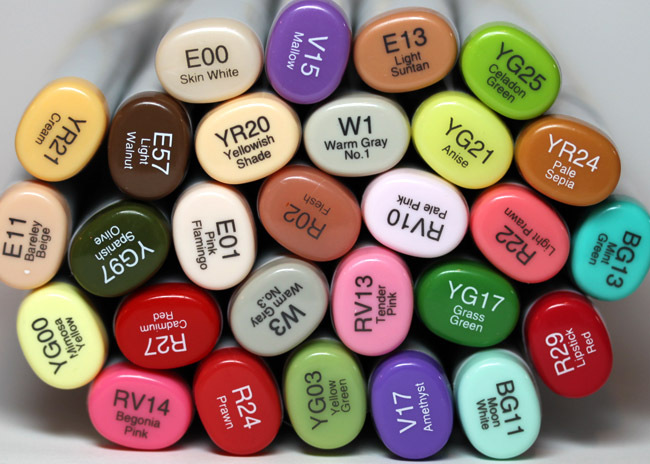 I colored this with my Copics and added all that gorgeous color with my Viva Deor pens. I don’t know about you, but I LOVE a card with rainbow colors on it! And I love it even more when its on a clean white background. Thanks for stopping by and taking a look! Scroll down for the DT call going on now for OCS.